U.S. President Barack Obama, speaking at a White House summit on countering violent extremism, said his country is not at war with Islam but with people who have perverted the religion. 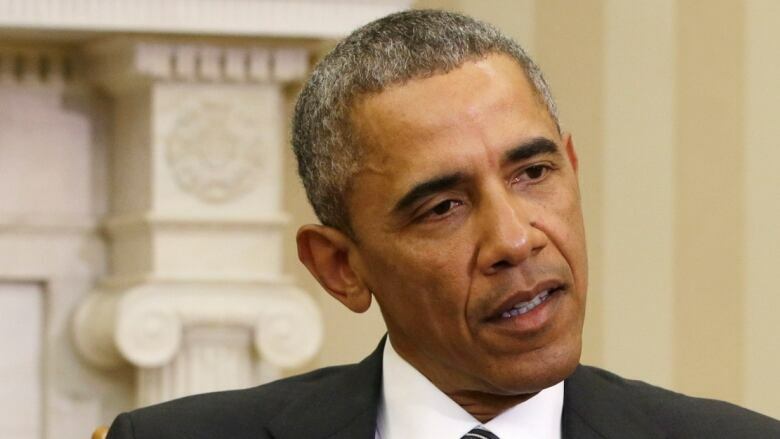 U.S. President Barack Obama says his country is not at war with Islam but with people who have perverted the religion. Obama was speaking Wednesday at a White House summit on countering violent extremism. He is calling for a focus on preventing militants from recruiting and inspiring others. Some have criticized his administration for avoiding linking terrorism directly to Islamic extremism. But Obama said those fighting for the Islamic State in Iraq and Syria (ISIS) and al-Qaeda are not religious leaders, but terrorists. He said no religion is responsible for violence and terrorism, adding that he wants to "lift up voices of tolerance" in the U.S. and beyond. "We are not at war with Islam. We are at war with people who have perverted Islam," Obama said at a media briefing during a break in the three-day gathering of police leaders, lawmakers and mayors from around the world. The president said local leaders, including those in the Muslim community, need do more to reject the "narrative of violent extremists" that promotes an "inherent clash of civilizations." The president said leaders in extremist groups are "desperate for legitimacy," portraying themselves as holy warriors and "propagating the notion that America and the West are at war with Islam. We must never accept the premise that they put forward," Obama said. "They are not religious leaders. They are terrorists," he said. In order to stop the recruitment of youth to fight for al-Qaeda and ISIS, Obama said local leaders "have to stop the twisted ideology used to incite others to violence." The summit to combat extremist groups is turning out to be different from what Obama originally envisioned. Planned for last October, the summit never happened before the midterm elections. In the months since, the situation has just grown worse, with ISIS metastasizing. European cities have learned firsthand that extremism's reach is not confined to the Middle East. "In just a very short period of time, we've come a long way in terrorist organizations' ability to communicate," Homeland Security Secretary Jeh Johnson said Wednesday as he opened the second day of the three-day event. "They have the ability to reach into our communities and attempt to recruit and inspire individuals who may turn toward violence right here in the homeland." As crises boil over in Yemen and Libya, Obama is asking Congress to take a tough vote backing his military plan to defeat IS extremists in Iraq and Syria. U.S. military action has so far proven the wrong tool to combat a robust social media and propaganda operation whose success at recruiting fighters and jihadists from western communities, including such U.S. cities as Denver and Chicago, has been impressive. With that threat in mind, Obama hopes to concentrate the world's attention on the need to combat underlying ideologies that entice otherwise modern individuals — including many disaffected young people — to behead a non-believer, kidnap a schoolgirl or shoot up a synagogue. During the three-day conference, Obama is working to highlight local models for preventing radicalization that could be replicated in other communities. "Groups like al-Qaeda and ISIL exploit the anger that festers when people feel that injustice and corruption leave them with no chance of improving their lives," Obama wrote in an op-ed article Wednesday in the Los Angeles Times, using a common acronym for the Islamic State group. "The world has to offer today's youth something better." The White House finally put a date on the calendar for the summit last month, in the wake of a shooting at a Paris newspaper that shook Europe to attention and earlier attacks in Canada and Australia. In the weeks since, Obama and top U.S. officials have sought to portray the U.S. as at a lower risk because of what they call an American tradition of making immigrants feel like full members of their new society. "We haven't always gotten it right," Vice President Joe Biden said Tuesday as he opened the summit. "But we have a lot of experience integrating communities into the American system, the American dream." Obama's keynote speech to the summit on Wednesday followed a series of speeches and panels examining the links between extremism and faith, gender, the Internet and the private sector. Leaders from local communities will present so-called "pilot programs" they've put in place in Los Angeles, Boston and Minneapolis.